WTF: What's the Story With the Hidden Cemetery in Waterbury? Two Seven Days readers recently inquired about a small cemetery that's visible to motorists traveling southbound on Interstate 89, just beyond the Waterbury exit. 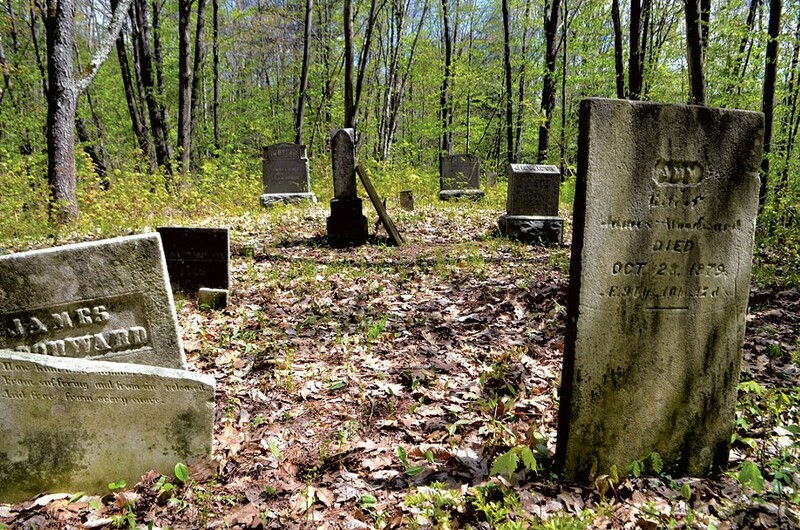 Bordered by the highway to the north and the New England Central Railroad line to the south, the graveyard can be spotted through the trees near mile marker 62. But there's no access road leading to the burial sites, nor any signage explaining its origins. WTF? Much of the year, leafy trees or snow hide the cemetery from view. In the spring, however, a smoothly polished monument might reflect the sun, catching the eye of a passing motorist. The cemetery has attracted its fair share of attention over the years; the Green Mountain Graveyards Facebook page features 12 photos of its headstones. But some of that attention has been of the unwanted variety — from vandals who, in one case, targeted the grave of one of Vermont's oldest known prisoners of war. According to Linda Kaiser, an archivist with the Waterbury Historical Society, the site is known as the Johnson Cemetery — the Vermont Old Cemetery Association lists it as the Johnson-Jewett Cemetery. It's one of 13 known cemeteries in Waterbury. Though the Johnson Cemetery is off the beaten path, it's not that hard to find. This reporter parked behind the Ice Center on River Road, then hiked south, past the old town dump and across the railroad tracks, finally scampering up a steep embankment. Located atop a small hill that was once part of the Johnson family farm, the cemetery contains at least 33 known graves, most of which date from the mid to late 19th century. Many of the headstones are faded and in disrepair, either broken or knocked over by weather, branches or more malicious forces. Beside one stone is a tattered American flag with a rusted, cast-iron medallion for the GAR, or Grand Army of the Republic; it marks the grave of A.P. Jewett, a Civil War veteran. "The Boy Scouts used to go down there and maintain it," Kaiser notes, "but that hasn't been done in years." The lifespans of the cemetery's occupants vary widely, from the youngest, a 5-month-old baby boy who died in 1873, to others who lived well into their eighties and nineties. One of the more recent interments — in 1912 — was that of Clitus Johnson. A December 4, 1912, story in the Waterbury Record reported that Johnson was killed by a locomotive while crossing the tracks with his horse team, en route to the village. Described as "one of Waterbury's best farmers" and "a very industrious man," Johnson was found on the "pilot of the engine, with life extinct." Other family members interred there had longer lives. The story of Zachariah Bassett, a Revolutionary War veteran who was born on July 20, 1759, in Milton, Mass., should be of interest to any Vermont history buff. According to an entry about him on the website Find a Grave, Bassett enlisted in the army for eight months, at Roxbury, Mass., in Captain Kimball's company. At the end of December 1775, Gen. Washington's army was reorganized and Bassett's unit dissolved. He then reenlisted in Col. Samuel Holden Parsons' Connecticut Regiment of the Continental Line. When the British evacuated Boston in March and April 1776, Bassett's regiment marched under Washington to help fortify New York City. Bassett later fought in the Battle of Long Island and the Continental Army's "disastrous retreat" from New York on September 15, 1776. In the fall of 1778, according to the Find a Grave entry, Bassett enlisted as a seaman aboard a 36-gun frigate called the Alliance. Its first assignment was to carry the Marquis de Lafayette back to France to petition the French government to boost support for the colonial revolution. The Alliance left Boston for Brest, France, on January 14, 1779. Sometime between February 2 and its safe arrival at Brest on February 6, the frigate captured two British vessels. "[Bassett] was put onboard one of the prize ships to help carry her into port at Brest," the notation reads. "In route, however, the prize ship was re-captured in the English Channel by a British privateer and carried into Plymouth, England. Zachariah [Bassett] spent the next 3 years and 11 months in the Mill Prison at Plymouth. He was released from prison [in a POW exchange] at the close of the Revolutionary War and returned home." Bassett and his wife, Priscilla Damon (1760-1840), moved to Bridgewater, Vt., in 1789, then to Waterbury in 1838. After surviving nearly four years in a British prison, and outliving his wife by 13 years, Bassett died on March 15, 1853, at the ripe old age of 93. Alas, Bassett hasn't always rested in peace, and not just because of the freight trains and tractor-trailer trucks rumbling past his grave. In May 2011, Mark Backus of Bristol, an avid genealogist, went to visit the grave of Bassett, his great-great-great-great-granduncle, only to discover that his tombstone had been stolen. Backus reported the theft to the Vermont State Police but, to date, the monument has not been recovered. "We are still hoping someday to have someone return that headstone or give us a heads-up where it is," Backus says. "It might be somebody's coffee table in the area. Or it might be the property of a Chinese billionaire. But an American Revolutionary War headstone, with a story about a prisoner of war on it, is not a common one."